Perfect for summer entertaining, this quick and easy Strawberry Spinach Salad is a delicious healthy dish you’ll want to add to your summer menu. I love cooking with seasonal ingredients and the easiest way to incorporate fresh seasonal produce is to include it in a salad. There is nothing like fresh fruit to lighten and freshen up a summer dish. This time I’m using fresh strawberries to make an easy and flavourful salad that is sure to make you want a second serving! This Strawberry Spinach Salad is best when made with tender baby spinach and sweet juicy strawberries. I like to top mine with crunchy toasted walnuts, tangy and creamy goat cheese and a few slivers of red onion. Dressed with a tasty homemade maple balsamic vinaigrette, this salad is simple yet special enough to make for company and special occasions. 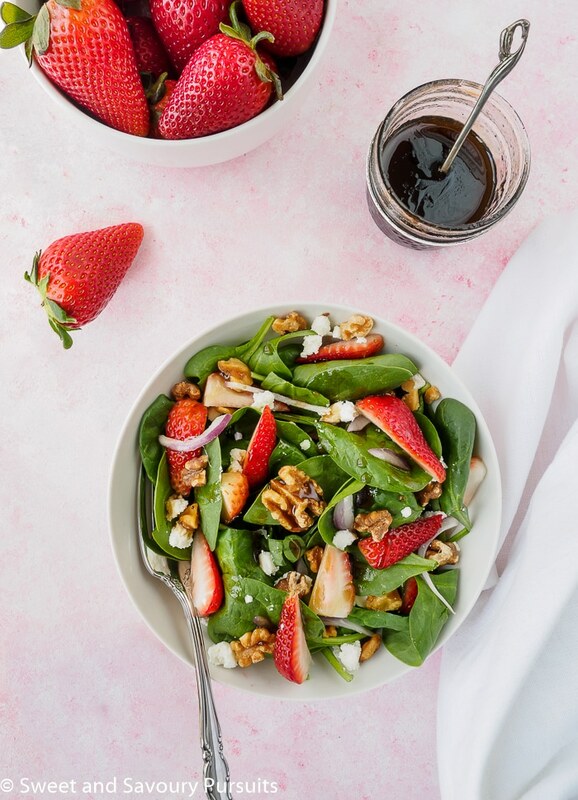 All you need are a few key ingredients to make this summery Strawberry Spinach Salad and maple balsamic vinaigrette. Other than the spinach and strawberries, the rest of the ingredients can be altered to suit your tastes or what you have in your pantry and refrigerator. You can use feta cheese or blue cheese instead of goat cheese, pecans or almonds instead of walnuts. Before toasting the walnuts (or nut of your choice), I like to drizzle them with a touch of oil and maple syrup and add a sprinkling of cayenne for a little heat, or you can use this recipe to jazz up your nuts. This step isn’t necessary but adds extra flavour, and don’t forget to toast more nuts than you’ll need for the salad, they’re great for snacking too! I love a good sweet and savoury salad dressing and for this Strawberry Spinach Salad I used only maple syrup, good quality Balsamic vinegar, and a bit of salt and pepper to make the dressing. If you don’t have any maple syrup for the dressing, honey will do just fine! I just can’t wait to make this Strawberry Spinach Salad using ripe local strawberries! I’m sure this salad along with this Watermelon and Feta Salad will be on rotation at my home this summer. Enjoy! With a rack in the middle of your oven, preheat the oven to 325°F. Line a baking sheet with parchment paper. Bake for 8 to 10 minutes or until nuts are toasted and fragrant. Let cool. Place all ingredients is a small jar and shake well. Set aside while you make the salad. Place the washed and dried spinach in a salad bowl and top with quartered strawberries, sliced onion, crumbled goat cheese and toasted walnuts. Reserve a few strawberries, nuts and cheese to top the salad with after it has been dressed. Dress the salad and toss. Add reserved strawberries, walnuts and goat cheese to top. Serve! Use only as much dressing as needed and store the remainder in the refrigerator for your next salad, because you'll want to make this salad again and again! Nice. One of my favorite summer salads to serve when having guests for dinner as it makes for a pretty presentation. Thanks Karen! Yes, not only is this salad delicious but it’s also visually lovely, which is important, especially when serving guests! I love everything about this salad! Thanks for sharing! Thanks Karly, honestly so do I. I’ve been having it almost daily either for lunch or supper for the last week now!